PlayStation Plus Subscription Bonuses for New Mingol! To celebrate the release of New Minna no Golf, PlayStation Plus will be giving away some added bonuses which I think we already should have the Dynamic Theme if we pre-ordered the game or participated in the closed testing. 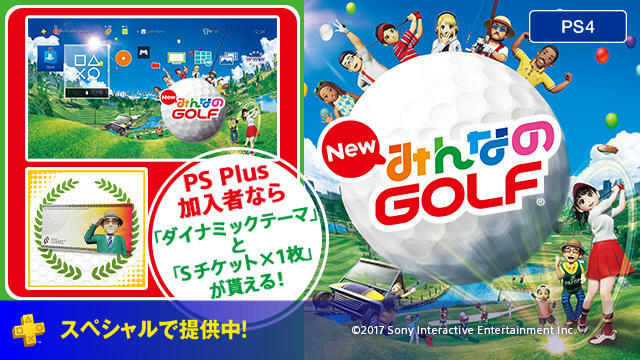 PlayStation Plus Japan Subscription Purchased starting from Wednesday the 6th or September to the 5th of December 2017 will receive a Dynamic Theme for Minna no Golf and a S-Ticket for use in the game… I assume the S-Ticket actually stands for Suzuki Ticket. It’s a pretty nice bonus to get, though maybe an extra closet extra club set would have been a more useful bonus. Either way I haven’t subscribed yet so seems to be a good time to start.